I thought that I would share with you something that I have been doing for awhile now; I keep a high capacity USB flash drive on my key-chain as backup for the personal files on my main computer. I had chosen the Corsair “Stealth Survivor” 256GB flash drive, given its capacity to hold all that I need, and given its rugged and waterproof design. Imagine losing all of your personal data, photos, etc.., from your computer? The fact is that eventually it WILL happen. Hard drives fail, computers fail, there might be a theft, fire, or other damage which results in loss of your personal data. While some people use “Cloud” services to store and/or backup their personal data, I don’t do that. Rather, I prefer to keep all of my data within my personal physical tangible possession and control. Therefore it is wise to back it up on at least one other device! 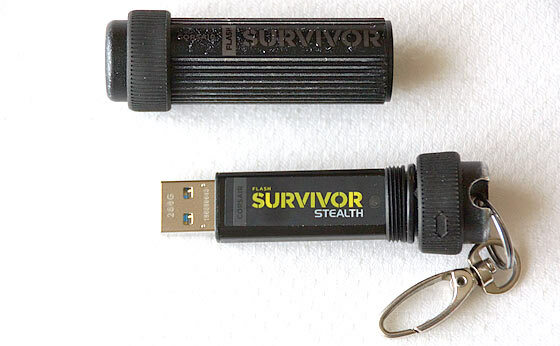 One of my backups is the Corsair Survivor Stealth 256GB USB 3.0 Flash Drive . It has been on my key-chain for several years without issue. Other than exterior scuffs on the metal case, the electronics have held up flawlessly. This Flash Drive might actually be the best USB emergency storage device that can clip to your key-chain. Why? 1. It’s case is metal and protects the flash drive itself from physical damage. “Hard-anodized, aircraft-grade aluminum housing”. 2. The USB case is waterproof. There’s an o-ring at the threaded section (see the picture). 4. 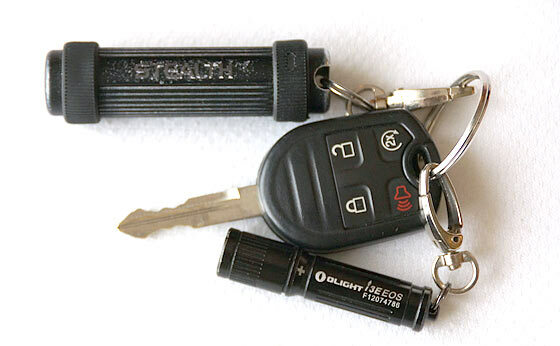 It attaches easily to your key-chain, which means that it is always with you. The way that I utilize this flash drive as a backup for my various personal files is to periodically copy and paste files and folders of my choosing from my main PC to the flash drive. I encrypt some of the files (and folders) while others I don’t bother to encrypt (photos, and other such files which I’m not concerned about privacy). CONCLUSION: For “high-tech” preparedness, I recommend that you consider backing up your important files on another storage device such as a USB flash drive. I like this one because it’s always on your key-chain and therefore stays with you wherever you are (assuming that you keep keys with you). In general, always keep one backup outside your residence. What good are backups if the house burns down with everything in it. Always encrypt all your drives! If devices get stolen, thieves will look for valuable information. Just having your email address book and a few tidbits about you can be enough to steal your identity and hack your friends’ accounts as well. Do you think this metal case may also offer EMP protection to the drive? I like seeing that Ford key any day! I keep several in safe boxes. I would nvr keep one on a key chain, in case its lost. I don’t have this type of geek stick, I do like it though and would buy a smaller flash version. I now have a working geek stick I carry and backups (2) in a safe. I have had a geek stick fail and munge up the files, fortunately I keep a paper copies for backup also; much fun retyping stuff and taking new images of the “valuables”. Too much of a hurry and yank the stick before power down, not recommended. Might as well just get the microchip implanted in your brain! What???? you don’t already have one??? Are you sure??? I wondered where the cricket noises were coming from….now I know. having it on your person, containing your medical files could help Doctors if you were in an accident & unconscious, etc. A useful tip for emergency services is to have an ‘ICE’ contact in your phone (ICE = In Case of Emergency). Use the Notes field for: your blood group, allergies, medications, next of kin contact details & any other relevant info – such as Whether you wear contact lenses). Oh, and don’t lock your contacts or they won’t be able to get to it. There are many negative (one star reviews of this stick) on Amazon – have they addressed the problems listed? Dependability is paramount for me. I should add that proper glue or other method of attachment would solve many of the problems with the device coming apart. Crazy glue maybe. All I can say is that my device has held up flawlessly on my key-chain full time for several years. 11% one star seems high – I would expect most products to be in the 1 to 2% just because of shipping, accidents, idiots, trolls, misuse, …. just my opinion. Homebody, It is very rare for a product to have just 1 – 2% in the 1-star category rating (although if you find it, that’s a great find!). Over the years I have learned to attribute that approximate chunk of 1-star ratings (5 – 10%) to the irrelevant category. Not always!, but often enough. When I have purchased products in the top 80% percentile, I’ve never been left down… (knock on wood). 1. Backup your computer stuff on a regular basis–monthly is good, daily is better. Most computer users do not backup their data and documents. Get started today! I backup my stuff daily. Once you get in the routine of copying you stuff, it becomes automatic. 2. Use and keep several flash drives (-or- external drive backup media) and rotate them to have multiple backups and ensure the quality of your data. Your storage at home -or- your office/work place should be fire resistant -or- fire proof. 3. Keep two drives off your property like in a bank box -or- at your work, etc. 4. Make digital copies (scan) of your important documents…you know what they are: DD214s, birth certificates, insurance documents, wills, etc. and for God’s sake, copy them to your backup drives. The personal time and money you spend on this activity is well spent. It’s always with you when you travel or are away from your home (assuming that you take your keys with you). This provides the availability to all of your chosen backup content if needed no matter where you may be or whether or not you have your laptop, etc.. with you. Additionally, as noted, any data that you feel is private, you should encrypt (easy to do).